Shizuoka Prefecture’s 50,000 seat Ecopa Stadium opened just before the 2002 FIFA World Cup (hosting 3 games), and as the prefecture’s biggest stadium is used as a part-time home ground by both main Shizuoka teams (the nearby Jubilo Iwata, and Shizuoka City based S-Pulse). 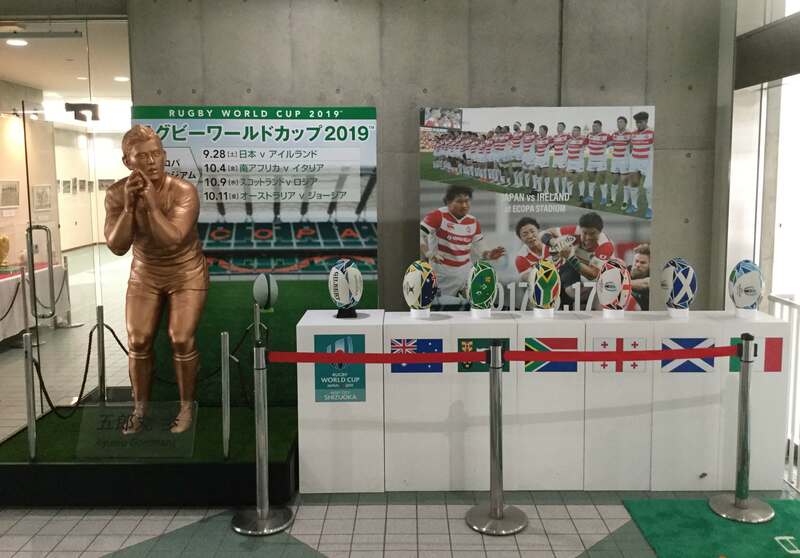 It’s also sometimes used by the Brave Blossoms for home international test matches, so it was an obvious venue choice and Japan will play Ireland here in what could be a crucial Pool A match (one of 4 pool matches at this stadium). The stadium’s a 15-minute walk up the hill from Aino Station, a fairly minor station on the main JR Tokaido Line. If arriving by shinkansen from the Tokyo direction you need to get off at Kakegawa then take the local train 1 stop west to Aino – the Nozomi & Hikari trains don’t stop at Kakegawa, so make sure to take the Kodama (it’s also possible to take the Hikari to Hamamatsu (see below) then double back to Aino – it’s more expensive, but with the JR Pass that makes no difference, and the journey time’s about the same). Coming from points west, the closest shinkansen station is Hamamatsu from where it’s another 20 minutes on the Tokaido Line. Hamamatsu is served by the Kodama and most Hikari trains, but not the Nozomi. IC cards can be used throughout the region from Nagoya across through Shizuoka, but don’t get the Luluca (local Shizuoka card) or Nicepass (local Hamamatsu card); instead get the Toica card from any JR station to ensure compatibility in other regions. There’s a budget hotel in front of the station called Cosmo Inn, very likely to be fully booked of course and it’s not listed on the usual OTAs but you can try using their website (Japanese only) here, reservation page here (the email address is probably the best bet). There’s little else in the vicinity of the stadium, but the small towns of Fukuroi & Iwata (one & two stops west on the Tokaido line respectively, search here), and Kakegawa (one stop east where you change to/from the shinkansen, search here) have a few business hotels. There are small two hotels near Iwata Station which again aren’t listed on the OTAs and only have Japanese websites, but you could give them a shot: Iwata Park Hotel and Iwata Station Hotel (maybe try the reservation page here). Yaizu & Toyohashi could also potentially work if you can’t find anything else. See here for more on Nagoya. 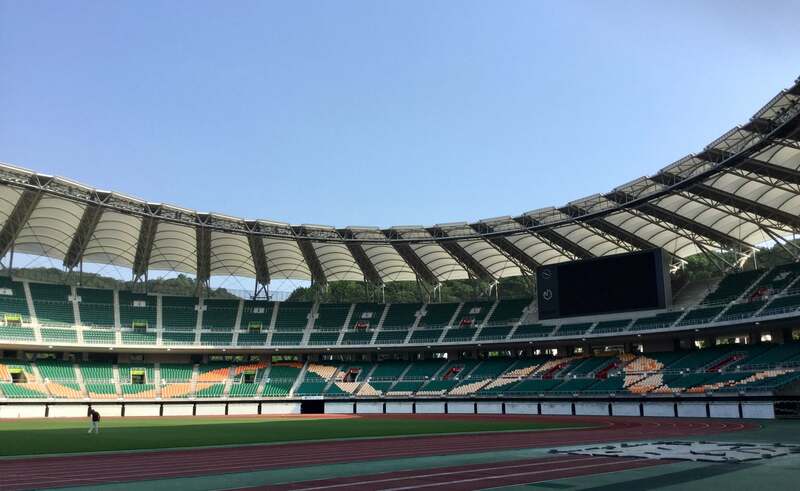 There aren’t any listings around the stadium, but it could be a good option for basing yourself in Hamamatsu or Nagoya. New users can get a $35 discount from their first Airbnb rental through Rugby Guide Japan, simply click here and sign up. Kakegawa: Kakegawa Castle is a modern reconstruction, but as it was done using traditional techniques it’s considered one of the better castle reconstructions in Japan. It’s a 10-minute stroll north of Kakegawa Station. You can also tour Shizuoka’s famous tea fields by steam locomotive on the Oigawa Railway, accessed from Kanaya Station which is two stops (15 minutes) east of Kakegawa on the JR line. Hakone: the Fuji-Hakone-Izu National Park occupies eastern Shizuoka Prefecture (as well as bits of neighbouring Yamanashi & Kanagawa prefectures), consisting of the Mt Fuji area and the Izu Peninsula. The World Cup’s too late in the year for climbing Fuji (the trails are closed in early September), but you can still take the bus up to ‘Fujinomiya 5th Station’, which is the car park and trailhead on the south side of Fuji at 2400m. Catch the bus from Shin-Fuji Station (weekends only during the World Cup, 2 round-trips per day with 30 minutes at 5th Station, schedule here), which is served by shinkansen bullet trains (specifically, the ‘Kodama’ all-stop trains). Hamamatsu’s relatively large expat population mostly consists of Brazilians & Peruvians, so the nightlife has a reputation for being livelier than usual in medium-sized Japanese cities and with a little Latin flair; I’ve never personally sampled it though, so you’ll just have to see what you can find. Any questions about Hamamatsu or Ecopa Stadium? Give me a shout below and I’ll get back to you.